Pelletier and Bard work hard to produce cows that are not only beautiful, but also productive. With 30 dairy cows--the typical Quebec farm has twice as many--Ferme Missiska's Caroline Pelletier and Paulin Bard produce milk that they turn into cheese. How have they managed to make a go of it? They've had their share of struggle that's involved plenty of hard work and a lot of debt. They've remortgaged their home and received help (and cows) from their families so they could build up capital. But with 10 kilos of quota, they've managed to provide for a family of four, hire one loyal employee, expand and build a cheese-making operation--all at age 35. 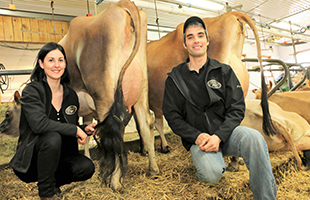 "We wanted to showcase our top-quality milk and produce the best cheeses, because right now, our quality is lost in the system," says Pelletier, who has a degree in agronomic sciences from Université Laval. Ferme Missiska's Jersey cows, which are already producing the best milk for making cheese, with 5% fat and 3.9% protein, are well-conformed, with an average of 86 points. In short, Pelletier and Bard work hard to produce cows that are not only beautiful (12 cows have been graded excellent), but also productive (averaging 8,000 kg of milk per cow a year). In this biking paradise, where they are some 20 vineyards close to the Saint-Armand-based farm, close to Bedford, success is practically guaranteed. The goal is to process all of the 240,000 litres produced annually within 5 years and maybe send a few shipments outside Quebec. "For me, it's another way to feel fulfilled," says Pelletier. The couple, who are originally from Brome-Missisquoi (Pelletier) and Kamouraska (Bard)--hence the name Missiska--has no choice but to diversify their revenue stream. Because the cow barn can hold no more than 30 animals, and their 100 acres are just enough to produce food for the cattle, they had to use their genetics expertise to make up to 20% of their revenue from the sale of animals and embryos. A bull, MISSISKA MACKENZIE, went for US$60,000! These two know a lot about cows: while Bard worked as an inseminator, Pelletier worked in genetic improvement for the Centre d'insémination artificielle du Québec (2005 to 2009). Agri-tourists will have to wait until the holidays to get a taste of Fromagerie Missiska's products, including a chaource cheese (from France's Aube and Yonne departments), a variety not yet available in Quebec. Chaource is a lactic-curd, whole-milk cheese that's cylindrical in shape, with a mould rind. It's ladle-moulded and left to slowly drain, resulting in a creamy texture, smooth finish and chalky centre that will surprise many. Not Pelletier, though: she already eats it three times a day. "If I'd known, I would have gotten help from experts sooner," says Pelletier, who's no longer shy about calling on solid organizations like the Centre d'expertise fromagère du Québec or professionals whose fees are partially reimbursed by assistance programs (Réseau Agriconseils).